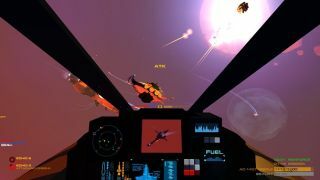 Indie space sim Enemy Starfighter has a new trailer, giving us a look at what developer Marauder Interactive and game creator Mike Tipul have been up to since first announcing the project in late 2012. The new video hints again at the hybrid approach being built into the game, which puts players in command of an imperial power called the Harbinger Fleet . As we saw in the prototype footage last year, the game has two primary points of view in its staging of imperial conflict. When not in the cockpit of your interceptor spacecraft, you'll take command of an entire armada. While the visual appeal of Enemy Starfighter is—for me—pretty irresistible, I'm also eager to learn more about the way the strategy elements of fleet movements are being integrated with the dogfighting and close combat. Tipul has released several other short development videos this year, detailing enemy AI and fighter speeds . The new trailer coincides with plans to show off the project at the upcoming PAX Prime Indie Mega Booth event in September in Seattle.